Pelagic fish such as North Sea herring swim in large, dense shoals. This means that the stocks we target are seasonally abundant in particular places, in large quantities, and at high concentrations. We use this pattern of behavior to catch fish in controlled quantities, at the optimum time and place, over a relatively short period. 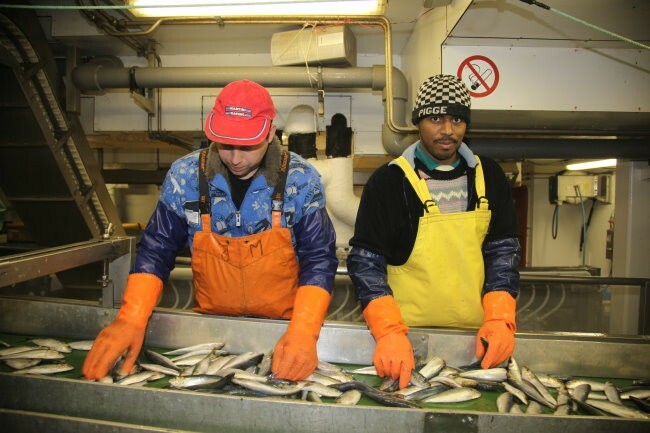 PFA ship-owners prefer to freeze the catch on-board, so need to take the processing unit with them! The large size of PFA member vessels is therefore related to the on-board processing and storage facilities, rather than the catching power of the vessel. The benefits of this strategy are that the fish are immediately frozen to maintain optimal freshness, whilst the efficient on-board process ensures a high-quality, protein-rich end product that is affordable for example, in poorer countries in Africa. A further benefit is that we do not constantly need to sail to and from the fishing grounds. This reduces wasted journeys and reduces our fuel use and overall carbon footprint. In the on-going debate on fisheries, a misconception has recently been introduced claiming that large fishing vessels – such as the European pelagic trawlers –endanger fish stocks. This claim holds no ground, as pelagic fishing is solely managed on the basis of a maximum catch quota per pelagic stock. The level of these catch quotas is based on scientific advice, and have no relationship to the size of the vessel. In fact, it is easier for fisheries inspection services to control a few larger vessels than many smaller vessels. Moreover, most pelagic fish is fished in colder zones in the northern and southern hemisphere and traded to far-away markets closer to the equator. This means that the entire supply chain has to be organised in a very efficient way, which is one of the main reasons why the production and marketing of pelagic fish have developed strong economies of scale over the years.